The ArchiCAD Masterclass South Africa 2015 schedule is out! :0) . . .
MultiCad will presents ArchiCAD Masterclass 2015 at Cape Town and East London. We will be providing a ArchiCAD Masterclass ranging from Absolute Beginner to Advanced user training. During the 10 days, trainees will be doing a real office workflow simulation including topics such as Teamwork, Revision, IFC, Smart Tools, Rendering & more scenario’s to get their ArchiCAD skill level to a maximum. If you attend all 10 days training, the training is absolutely free. If training you pass the ongoing testing, a cash prize will be awarded for an office year-end function! 2 professionals per company are required & students are welcome too. This training will prepare you for RegCON acceptance level training. Real Office Simulation: Trainees will spend the 10 days in an office simulation, learning how to solve real issues that arise in an architectural office & solving them on the spot. This experience provides the trainee with the knowledge on how to solve current or future issues in the office environment. From project set-up, beginner topics to project collaboration, expert topics. The training will touch on everything ArchiCAD has to offer including tips to ease your workflow. MultiCad Design Solutions CC. was founded at the end of 2010 by Francois Swanepoel as the local ArchiCad Solution Centre for the Western Cape Region, working with Graphisoft South Africa. Francois is an experienced ArchiCad user (2001) and a qualified Graphisoft Registered Consultant since ArchiCad 13 (2010). “MultiCad” also serves end users as an accredited Graphisoft Trainer & User Support Center in both the Western & Eastern Cape. 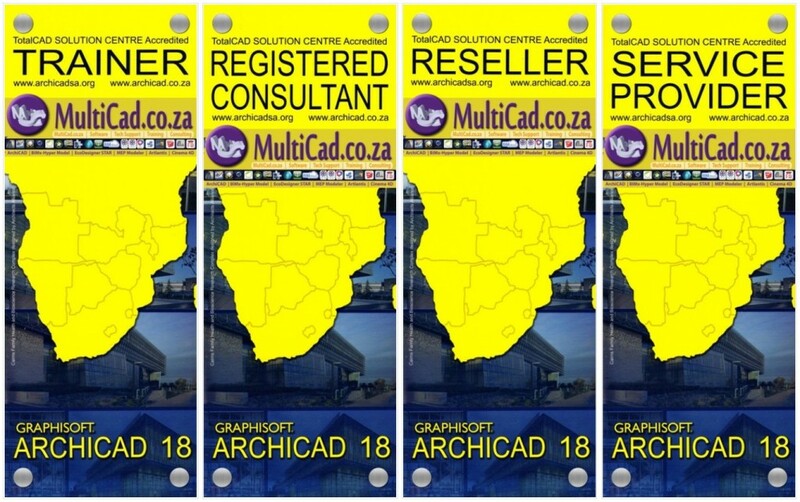 “MultiCad” is a national Reseller in South Africa.